Learn the Tibio-talo-calcaneal (TTC/Double ) fusion with Wright Valor nail. surgical technique with step by step instructions on OrthOracle. Our e-learning platform contains high resolution images and a certified CME of the Tibio-talo-calcaneal (TTC/Double ) fusion with Wright Valor nail. surgical procedure. Tibio-talo calcaneal fusion (TTC) is a less common operation for arthritic and other conditions of the hindfoot. It consists of fusing both the ankle and subtalar joints to create a block of three bones which would include the distal tibia, the talus and the os calcis in a strong and stable column. The use of the hindfoot intermedullary nailing system which is inserted retrograde through the os calcis into the tibia to assemble an axially stable system is very successful in maintaining position and aiding in these fusions. The use of intermedullary systems for TTC fusions have been undertaken over the last 2-3 decades with varying degrees of success. There are different varieties of nails which involve either curved design to create a 3-point fixation within the fusion construct and to allow for the lateralised position of the oscalcis underneath the tibia. The Wright Valor hindfoot fusion nail has got significant advantages by combining multi-planar screw trajectories with an internal compression system which facilitates compression of the joints. The Valor nail is available in two diameters 10mm and 11.5mm with lengths from 150-300mm. This allows the use of the nail in most anatomical variations of the tibia and can offer the integral strength particularly with bending moments that occur both in the ankle and in the subtalar joint. Moreover, the locking systems both proximally and distally allow rotational stability to be maximised in such a construct. The Valor system also comes with a calcaneal compression slot through which a screw can be inserted which is then compressed by the unique internal compression system. The Valor nail comes with a proximal static and dynamic option for proximal locking which allows for later dynamization in case of protracted or delayed healing of the fusion interfaces. Furthermore, there is also a proximal freehand screw at the proximal tip of the nail for the longer versions. This avoids the need to use a long lever arm on the jig systems minimising error in proximal interlocking screw positioning. The distal calcaneal compression screw which uses a lateral to medial insertion is well positioned in the nail and avoids the posterior tibial neurovascular bundle on the medial side. The calcaneal locking screw is inserted from posterior to anterior allowing excellent purchase both in the tuberosity and in the anterior process of the os calcis. The subtalar screw is oriented 57o degrees proximally off the transverse plane and 20o off the trajectory of the calcaneal screw. This prevents stress fractures in this area and is orientated so that the screw is able to provide axial compression for the fusion interface between the talus and the os calcis. Perhaps the most unique feature of the Valor nailing system is the presence of an internal compression mechanism following initial proximal locking. 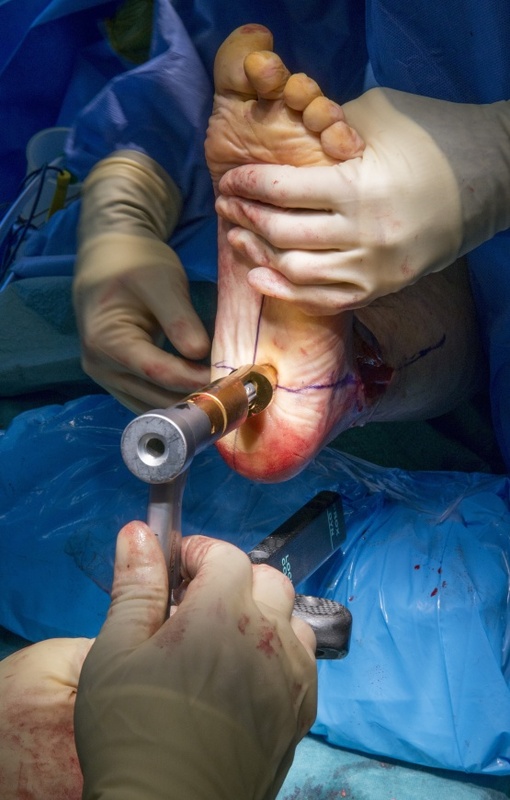 The calcaneal compression screws inserted across dynamic slot in the nail and internal compression using an internal compression screw allows the dynamic compression of both subtalar and ankle joint prior to distal locking. Institution: Aneuran Bevan University Health Board ,Wales ,UK.